Prolab Creatine Monohydrate, in the 300 grams + 300 grams Free bonus size, has always been one of our best-selling creatine supplements here at Arnoldsupplements.com. 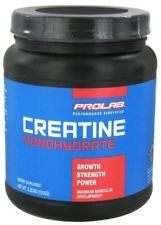 A great product, at an even better value, Prolab Creatine Monohydrate is 100% pure. Prolab has recently updated the packaging and labeling for this product. Check it out below and let us know what you think. PROLAB CREATINE MONOHYDRATE 300g +300g FREE! !